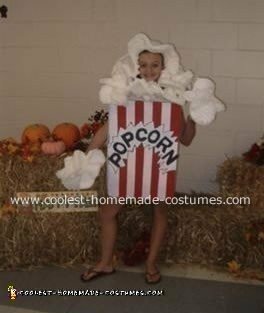 This popcorn costume was jointly made by a friend of mine and myself for her daughter. I did a similar version of this costume when my children were younger so we took the original idea and updated it a bit. The costume is made using a large box, red, white, and black paint, some spray paint, hot glue, and some egg crate foam. First we cut the box to the right length for her body, arm holes, and the hole for her head. Ten we traced on the pattern we wanted for the box and painted it. You can be creative with the decoration of the box. We stuck to a traditional movie popcorn look. Next we cut the foam in ruffle-y flower shapes. After the shapes were cut out we took rubber bands and rapped them around the centers of the flower shapes to make the pop corn 3 dimensional. We then glued the popcorn to the top of the box all around the head hole. We left two of the popcorn pieces for her to carry (for younger children in this costume, you could make the two hand pop corn pieces as mittens so they don’t have to carry them by outing the flower shape on their hand and wrapping the rubber band around at the wrist). Lastly, we made one larger flower shape big enough to cover her head and when she was ready to wear the costume, we wrapped a head band around the shape to hold it to her head. We took this costume to an area contest and it won 2nd place! Cutting popcorn from foam is a great idea, much more practical than hot-gluing ten million real popcorns. I’m not sure what you mean by egg-crate foam but I’m going to try to find out, it certainly sounds cheaper than craft foam! Awesome idea to use egg crate foam! I was planning on using popcorn and now there is no need for that!! !